In addition to A Discovery Of Witches, Wales has been the backdrop for Doctor Who, Sherlock, Harry Potter, and many more TV and movie hits. Gareth Skelding—a.k.a. Gaz—is the location manager for A Discovery Of Witches, and is known for his work on Sherlock, Da Vinci’s Demons, Torchwood and Dr. Who. After you read what Gaz has to say about Wales, you will want to pack your bags and visit this enchanting land. 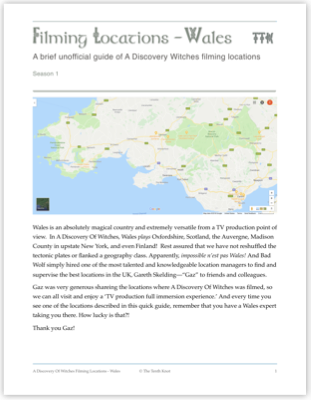 Whether you call it “location scouting” (American English) or “recce” (British English), as a location manager, Gaz is a Wales expert and treasure hunter, and Wales could not ask a better advocate. With a knot of four, the power tradition is stored. 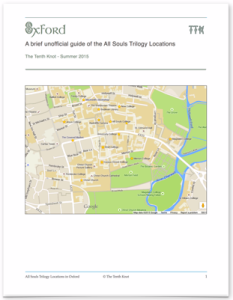 Our All Souls Holiday Shopping Guide is at its Fourth Edition! Honoring tradition, every year, we research fun and beautiful All Souls-inspired gift ideas. This year, we have quite a comprehensive list of gifts under $30—with presents for history buffs, science lovers, and yes, daemon lovers! And some of these items benefit the Bodleian Libraries! P.S. We’ve included the audiobooks for the fourth year in a row, hoping that fans of the TV adaptation will pick them up. They are truly phenomenal. We’re thrilled to bring you an abridged version of the Q&A with the brilliant panel of executive producers, Jane Tranter, Kate Brooke, and Deborah Harkness, with Teresa Palmer and Matthew Goode, at the Cardiff premiere of A Discovery Of Witches. The panel was moderated by Welsh television presenter Angharad Mair. It’s hard to believe another year has gone by! “Whenever something like that happens, you can bet there’s a timewalker nearby,” explained Sarah. 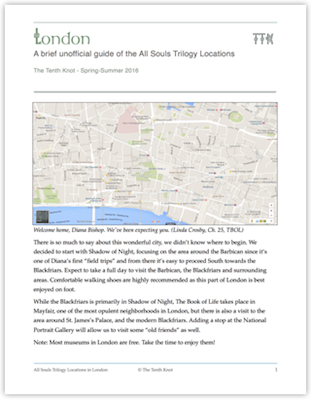 There’s definitely a timewalker in our neighborhood since it’s time for the All Souls Holiday Shopping Guide − Third Edition. Meet Isabel Parkinson, an undergraduate student of Philosophy and German at Oxford University. Isabel also happens to be a huge fan of the All Souls Trilogy. Her love for the book series brought her to ask Ruth Fitton, the talented painter working on Isabel’s portrait, to include A Discovery of Witches in her own portrait. Said portrait brought together Isabel, Ruth Fitton, and All Souls Con—and eventually The Tenth Knot. As a student at Oxford, Isabel shared what it’s like living and studying there, and yes, even working at the All Souls Library. But that’s not it. In a bonus post, Ruth shares some of her painting secrets. P.S. You will be able to admire a photo reproduction of the portrait at All Souls Con.